Miami has always been an ideal place to escape the winter blues thanks to an abundance of beautiful beaches, international restaurants and a culture that embraces art and design. The face of Palm Beach has become younger, hipper, and best of all FUN! Aspen offers visitors a combination of small town Western charm with the allure of high-end hotels, delicious restaurants and big city shopping. The Oregon Coast is part of the great Pacific Rainforest, the largest temperate rain-forest in the world. Stretching 350 miles from Astoria to Brookings the scenery is stunning at every turn. Beautiful, wide sandy beaches set against dramatic rocky coastlines call out for long walks no matter what the weather. Just under two hours from Portland, the town of Cannon Beach is known for Haystack Rock, an icon of the Oregon coast and a charming place to spend a few days. The weather on the coast can be unpredictable. December- February is rainy season with late spring becoming drier and summer the driest. A magical part of being on the coast is experiencing the atmospheric changes—the fog rolling in, the clouds thick as a wall surrounding Haystack Rock, the sun bursting through the maritime layer—all beautiful. Be prepared by bringing layers! For hiking enthusiasts we strongly recommend that you check out Saddle Mountain which is about a 20 minute drive from the Stephanie Inn. The hike begins at an elevation of 1650 feet and climbs to a height of 3290 feet over 2.75 miles of fairly steep terrain. The challenge pays off handsomely for those who refuse to quit. From the summit (on a clear day) you are able to see the Columbia river feeding into the Pacific Ocean in addition to the peaks of Mt Rainier, Mt. Hood, Mt St. Helens and Mt Jefferson. Bring plenty of water and maybe even a picnic lunch to enjoy up top! Coffee: After or before the complimentary breakfast at the hotel head to the adorable Sleepy Monk, for very good organic coffee roasted right in Cannon Beach. Hike: Walk in the footsteps of Lewis and Clark at Ecola State Park, just a 5-minute drive from downtown Cannon Beach. This is one of the best spots for panoramic views of the Coast—the sea stacks and small islands to the South, and to the West, Tillamook Rock, Oregon’s only offshore lighthouse. There are both walking and hiking trails and beach access at Indian Beach, popular with surfers. We hiked the 4-mile Tillamook head Trail climbing up through a tall forest of Sitka Spruce before reaching the top. Lunch: How can you not love the concept of the Screw and Brew: half hardware store, half restaurant. The funky space more than delivers with good burgers, salads and fish sandwiches. At Ecola Seafoods, a fish market with a bunch of tables, the packed house doesn’t seem to mind the no-frills-atmosphere as they happily consume steamers, clam chowder, fish and chips, and grilled locally caught salmon or halibut. The fresh Dungeness crab meat cocktail and a whole cooked crab were the clear favorites at our table. Town: Cannon Beach is a cute beach town with shops and galleries. If the line isn’t too long at Osburns, get an ice cream and walk around after lunch. The Rock: At low tide, walk right up to Haystack Rock to explore the tidal pools where kids of all ages are looking for starfish, crabs, shrimp and anemones. Tufted Puffins arrive late spring and summer to join the thousands of birds already calling Haystack home. Friends of Haystack are on hand to answer questions and to safeguard the ecosystem of this incredible monolith, formed from lava flows millions of years ago. Dinner: When I mentioned to a friend I was visiting Cannon Beach, she told me stop what I was doing and immediately call EVOO for a dinner reservation. She was so adamant, that I didn’t argue, and I was lucky enough to score a reservation. Chef Bob Neroni and his wife Lenore Emery have been welcoming guests for over 10 years to their unique venue, a combination cooking class and fine dining experience all in one. Watch each dish prepared with lively discussion from Bob and Lenore, who have a light banter that comes from years of experience. They use only the best ingredients--organic, local, and seasonal in their Mediterranean inspired menu. The food was delicious, sophisticated and layered, and the wine pairings were well thought out and complimentary. This was a fun night out and no visit to Cannon Beach would be complete without a stop at EVOO. Night Skies: Sunset is late in the summer, sometime around 9PM, allowing you to pack the most in a day. Luck plays a part here, as one day the colors can be spectacular and the next night a wall of clouds can roll in shutting down the sun splash. As the daylight fades away, a surprise awaits, as small beach bonfires begin doting the beach in small pockets for miles. Must do: Arranged ahead of time, the Stephanie Inn will set up a beach bonfire for you complete with all the s’mores fixings. Song lyrics for Kumbaya not included. **A special thank you to photographer Grace Hurtienne of Grace and Jaden, a husband and wife team who specialize in wedding and travel destination photography and cinematography. Click here to see their stunning photographs and the schedule for their upcoming workshops. From the moment she saw the view of the caldera, my teenage daughter gasped that unlike other places she had been, Santorini lived up, and exceeded, all the glorious pictures and postcards that had mingled in her imagination. Born from a cataclysmic volcanic eruption, Santorini, the southernmost island of the Cyclades group, thrills with dramatic cliffs rising up from the sea and white villages perched high above the caldera. Oia at its most northwest tip is famous for its awe-inspiring sunsets, breathtaking views and incredible hotels and restaurants hugging the cliffs. Oia’s charms attracts busloads of visitors, it gets crowded in the summer—real crowded! May and June are the best time to visit. Try Santorini’s own micro brews--the Yellow, Red or Crazy Donkey or the local Fix beer. Domaine Sigalas Winery, right down the road from Perivolas, is open to the public for tours or to visit their tasting rooms. The wines, especially the whites, have been gaining an international recognition and are truly delicious. It’s nice to visit in the early evening as the sun sets over the vineyards. Want to continue eating healthy Greek food at home? Recreate the magic of your trip with the help of some of our favorite Greek cookbooks—Smashing Plates, How to Roast a Lamb, Food from many Greek Kitchens, and Kokkari from San Francisco’s acclaimed restaurant. 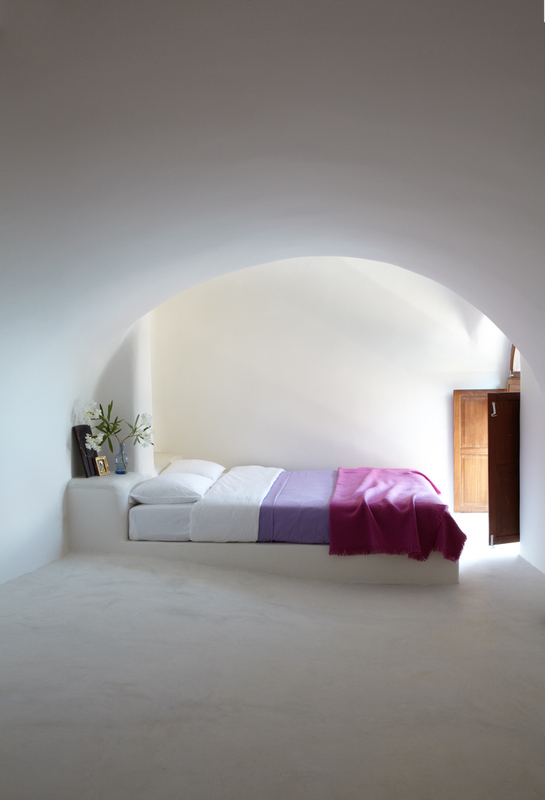 Stay: While there are many beautiful places to stay in Oia, there is only one Perivolas. Started by the Psychos family with a dream and a vision, and just that much of crazy, all the rooms are built dramatically into the Cliffside in restored 300-year-old caves. The hotel is set high above the Aegean with rooms spread out amphitheatrically. The décor is simple, letting the scenery steal the show. All white interiors are accented with just a touch of pink, of purple, adding to the overall effect. And it only gets better with one of the most photographed infinity pools in the world, drop dead vistas over the caldera and neighboring islands and an incredible spot for sunset. Location: Perivolas is on the outskirts of Oia, which is a good thing. It’s just a short walk (5-10 min. max), but it’s nice to be slightly outside of the main thoroughfare. I used, and highly recommend, Ronnie Liadis from Liadis Travel to organize our trip. Ronnie, recognized by Conde Nast Traveler as a specialist for Greece, has in-depth knowledge of the country and all things Greek. Ronnie also recommends Canaves in Oia, especially if you are traveling with children. Breakfast: Perivolas’ dining room, for guests only, is built in a converted wine cellar overlooking the pool. Breakfast is buffet style with made to order eggs. At lunch, or as a late afternoon snack, you must try the traditional Santorini dish of favas, done here beautifully with capers and tomatoes on top. (Santorini is famous for its favas, which are yellow split peas, not the green favas from broad beans.) The Dakos is another must order—a Cretan style salad of tomatoes, capers, cheese and olives over a dark rusk. Get Rolling: Head through town and run the steep steps down to Amoudi and back up, if that’s not enough of a work out do it more than once. For the ambitious there’s a hike from Oia to Fira that we had the best intentions of doing. The entire hike takes about 4 hours and is meant to be spectacular. On the Water: Greece is heaven out on the water with some of the most inviting swimming anywhere. Rent a catamaran for either a half or whole day, leaving from the small port at Amoudi. While the view looking down is pretty impressive, the view looking up at the white washed villages is equally as good. You can cruise around the Caldera and over to Thirasia, or head to Ios or Anafi Island to swim in coves and enjoy the white sandy beaches. A BBQ lunch was served on board. Time it to be out on the water for the most beautiful sunset. A highlight of our trip! Shop: During late morning when the cruise ship buses arrive en masse, and at sunset when the crowds aim to get their strategic spot, Oia is to be avoided –its really wall-to-wall people in the narrow, windy streets. Go early or late afternoon to have the town to yourself, or even after sunset when the crowds disperse. (The shops stay open late.) Atlantis Books is one of those special places, a small bookstore teeming with character. Started by expats from England and America, and reminiscent of Shakespeare and Co in Paris, there are books stacked everywhere. Go in and linger. Have fun exploring the maze like streets, finding your own favorite shops among the mix of chic boutiques and souvenir stores. There are many nice jewelry stores, some high end and some selling tons of inexpensive evil eye bracelets, which are good for gifts. Don’t miss Maria Baba Vida. Maria, a French ex-pat, has created a boutique with an eclectic array of jewelry and textiles from not only Greece, but also France and Asia. I left with 2 unique pairs of earrings and many stories from Maria. Eat: Two of the most acclaimed restaurants in Oia are 1800 and Ambrosia, both with stunning views. If you can bear to leave Perivolas go for an early dinner and catch the sunset. Make a meal of mezes at Skala, a laid back restaurant with views not just of the water, but of the donkeys traveling up from the quay below. The Red Bicycle is more casual, a quirky, charming restaurant with good food. Down in Amoudi, some people favor Dimitris and some prefer Katina, you can’t go wrong with either for freshly caught fish and seafood. Katina, look for the orange chairs, was one of my favorite meals in Santorini and I’m still dreaming of their tomato fritters. Discover: It’s well worth it to drive to the other side of the island to spend some time at Ancient Akrotiri, the Greek version of Pompeii. The entire site is enclosed and it’s fascinating to see the ancient city preserved after it was buried under volcanic ash during the Minoan period. Right nearby, take a look at Santorini’s famous Red Beach. You can choose to climb down and spend the day or just look at it from up high as we did. Next, drive to the lighthouse for spectacular views over the Caldera. Make sure to stop at the roadside stand right before you arrive to sample some of the local olives, cheeses, and the sun dried tomatoes, which are drying right in front on a rack in the sun. Don’t leave without some of the dried oregano branches, so much more fragrant than those you get at home. I only wished it was possible to bring back the jars of wild carpers and olives. Afternoon at the Beach: Perissa and Perivolas are Santorini’s well-known black beaches on the eastern end of the island. They are fun to see, but I prefer the white sandy beaches of other Greek islands. Pick a spot for lunch and rent some sunbeds for the afternoon. You can rent jet skis or go windsurfing. The best beaches closer to Oia are Koloumbos and Baxedes and the winds determine which beach to go to on any given day. Dinner: It’s crowded and it’s touristy, but if it’s your first time in Santorini you probably want to check out its main town of Fira. (Also spelled Thira) Overlooking the caldera, dine at Archipelagos or Naoussa for exquisite views, especially at sunset. One of the best restaurants on the island located in the hillside village of Pyrgos is Metaxy Mas; make sure to make your reservation well in advance. Must do: A friend, who has spent over 20 summers on Santorini told me this before I left: At the port of Ammoudi follow the path past all the tavernas (away from the parking area) and continue along the gravel around several bends--you'll come to a place with several old little fishing boats. Off shore is a little tiny island. The place will be filled with Italians who, for some reason, like to lie on the rocks and sun bathe. It might be crowded but this will be worth it. On the little island at the far side is a tiny church up around 20-25 feet off the water. From the platform at the church, people jump into the sea. You MUST all do this lest we will never consider you ever having had a true Greek experience. Some people do intense flips into the water, but I just go simple. It’s exhilarating and the kids will love it. The water here is crystal clear and it's an ultimate Santorini experience. Off the Beaten Path: Head to sleepy Megalochori. It feels more like old Greece than anywhere else in Santorini. Here there are little crowds and tourists, just a cute traditional Greek square. Wander the narrow streets, admiring the stone houses and the beautiful church. Have lunch on the square at Raki and definitely order the chicken kebabs. Even better come late afternoon so you can have dinner at Feggera, closed at lunchtime. Gavalas Winery, a classic old school winery is right at the entrance to town, arrange a visit before hand to taste their delicious wines. Night Cinema: Meander the beachfront of Kamari, browsing in the shops before heading to an early dinner at Irini’s or Nichteri . Then proceed to the open-air cinema a 5-minute drive from town. (All the movies are in English) Though we weren’t fans of the movie playing that night, World War Z, I still remember sitting underneath the stars, drinking a Red Donkey and watching Brad Pitt. Extravagant: Rent out the Perivolas Hideaway carved into the foot of a cliff on the island of Therasia, a 5 minute ride from Oia. More than just a luxury villa, it’s got the feel of a private island as its set in its own secluded cove, accessible only by boat. 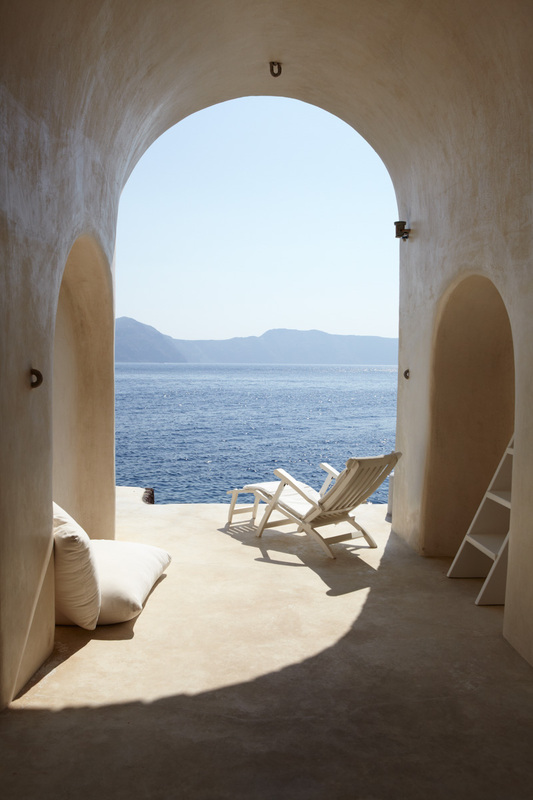 The décor is simple, but stunning with terraces overlooking the sea and Santorini. Saying it is extraordinary and jaw dropping is no exaggeration. The Hideaway comes with a private boat, sea kayaks, waterskies, wake boards and windsurfing equipment. Freshman fall, a long weekend break—where to go for a few days with my son? It was his desire to go to Lisbon; somewhere new to both of us, and easy enough to explore in a short time. Before we left for our trip, I came across a touching piece Frank Bruni wrote for the NY Times: How I fell for Lisbon. To paraphrase, Lisbon unlike many European cities has no major “checklists”--no must do’s like the Louvre in Paris or the Sistine Chapel in Rome. Rather, the City of Seven Hills (as it’s commonly refereed to) is ideal to wander, to roam, to get lost in. It sounded perfect for some catch up quality time with my independent college boy. I can’t wait to book my ticket to Comporta, the fashionable chic beach retreat just one hour from Lisbon. Under the radar for now, but with talk of an Aman opening soon that may change. (Though it looks like the project may be on hold.) Beautiful sandy beaches, great food, it’s a place to relax and unwind. I’m staying at Casas Na Areia, a super cool small hotel designed by architect Manuel Aires Mateus, or five minutes away the even smaller Cabanas no Rio, 2 old fisherman shacks turned into simple, but luxurious cabins along the River Sado, a natural nature reserve. You can be sure that I’m going to eat at Museo do Arroz. Stay: We loved the Barrio Alto, a small, chic boutique hotel designed by Grace Leo Andrieu, and what a location! Located right in the heart of the city bordering the chic Chiado and bohemian Barrio Alto neighborhoods, you can walk everywhere from here. Don’t miss having drinks or snacks on the roof top terrace with killer views of the Rio Tejo and the old Lisbon rooftops! Splurge: A friend just told us at Daytripper about Palacio Belmonte, an elegant and historic 10 suite hotel housed in a 15-century palace. Located high in the hills of Alfama, each extravagant suite is uniquely designed with private terraces overlooking the Tagus. With no televisions, air conditioning and room service it's not for everyone, but how often do you get to have a palace pretty much to yourself. Take a look at this property; it's pretty special! Morning: Arriving fresh off of the overnight flight put us in need of coffee; how convenient that A Brasileira, Lisbon’s most famous and iconic grand café, was right across the street. This is a great spot. After you admire the stunning art deco interior, have a “bica” (an espresso) and a pastry on the outdoor terrace. To Market: Mercado da Ribeira is Lisbon's main food market filled with stalls offering the freshest fish and vegetables of the day. It's been the city's main market since it opened in 1892. Recently, Time Out Lisboa magazine, transformed this market into a foodie hangout where top chefs bring their favorite dishes to the market. Ride: Jump on Tram 28 right outside the hotel to head towards Alfama, the oldest, most historic district in Lisbon. Meander the medieval alleyways and steep hills, admiring the colorful mosaics and constant incredible water views at every turn. Getting lost in the narrow streets is part of the fun! This is old school Lisbon, your picture postcard images. High up the red rooftops below make for a scenic panorama. It’s worth it to spend some time at Sao Jorge Castle. This Moorish castle dating back to the 10th century is visible everywhere in the city from its high hilltop position. After, head down and admire the view at the Santa Luzia viewpoint. A few steps away another ideal viewpoint is Miradouro das Portas do Sol. Even better go to Café Portas do Sol and recharge on one of the sofas or tables overlooking the water. You can have a light lunch or some drinks here while basking in the view. Saturday Market: Visit Feira da Ladra, the Thieves market. My son loved rummaging through the junk--I mean stuff-- at this flea market—musical instruments, clothing, and old records. We left with some military medals and vintage postcards. The market also sets up on Tuesdays. Wander: Head back towards downtown, making sure to stop in the magnificent Praco do Comercio, Lisbon’s grandest plaza. Then, head over to Rossio Square, and hit some shops along the way. You’ll soon discover that cork products are everywhere as Portugal produces half the world’s cork supply. Pelcor is a good place to shop for cork bags, bracelets, and all kinds of accessories. It wasn’t my thing but perhaps it will “pop” for you. I preferred admiring all the goodies in the many gourmet food stores—loads of bacalhau, tins of sardines, Porto, Madeira and other liquor digestives. Lift: I thought about skipping it, as there was a line and it seemed touristy, but I’m glad I waited at the Santa Justa elevator, a beloved Lisbon landmark. Your rewarded with incredible 360 views of the streets below and the surrounding area. It’s more than just scenic, but built for practicality, designed to connect the lower streets of Baixa, the downtown area, with the higher Carmo Square. Wander around Carmo Square before heading back towards Chiado. One Stop Shop: You don’t have to go any further to find gifts to bring home for friends, or yourself, than at A Vida Portuguesa, a beautiful store selling high end local products. Specialty soaps, old style traditional products, teas, exquisitely designed tins of sardines, even the Couto toothpaste in its bright orange and black box found it’s way into my suitcase as a souvenir. Sweet: There’s usually a line at Santini for the handmade gelato, try the cinnamon or bitter orange with chocolate. There’s a shop in Cascais as well where it all began back in 1949. Wine Before Dine: The Barrio Alto is quiet now with people starting to fill up the many restaurants, but still calm till the party really begins after midnight. At the Old Pharmacy sip some of Portuguals finest from their extensive list at small tables created from wine barrels. Dinner: We loved the tasting menu at 100 Mareinas and the shellfish stew with cilantro and spiced bread at Pap ‘Acorda. We had a great meal at Cantinho do Avillez, chef Jose Avillez’s trendy, more casual restaurant to his Michelin starred Belcanto, considered one of the best restaurants in Lisbon. Picky Eaters: Great pizza can be found at Casanova, along with great views along the river. Open late. Late night: Barrio Alto becomes one big block party at night with people spilling out into the streets. With over 250 bars, from quiet wine bars to more boisterous clubs there is something for everyone to join in the party. Beyond The City: You can easily travel by yourself to Sinatra or Cascais by train, each about 30 minutes, but as we only had a short time we decided to do the 7-hour X-day trip with We Hate Tourism Tours. Billed as the anti tour, this is a fun way to see many sights outside of Lisbon in a small group. (We were 8) Our first stop was Fairytale Sinatra, where we spent an hour at Quinta da Regaleira, a Neo-gothic mansion with picturesque lakes, grolloes, waterfalls and secret tunnels. The views from the house are pretty spectacular. After some time in town we headed to the dramatic viewpoint of Cabo da Roca, the most western part of mainland Europe. We spent some time walking the seaside promenade between Cascais and Estoril, and then drove to nearby Guincho Beach, popular with surfers due to the rough Atlantic waves. The beaches are beautiful, slightly wild and go for miles. I’d love to go back and spend more time on another trip. Our last stop was Belem; home to the National Place, Jeronimos Monastery and the Belem Tower. Some say the most delicious pastry in the world can be enjoyed at Pastel de Belem, try one of their velvety custard tarts and decide for yourself. While the Monastery and Tower were impressive, the scale of the production and amount of visitors at this pastry shop dating back to the 1830’s was equally enjoyable. Belem is easily accessed by a quick tram ride from Comercio Square, it’s definitely a must do when in Lisbon. Dinner: Playing tourist for the day we continued with a traditional Fado Show. Fado is the unique sound of Lisbon, the melancholy national music that is sung from the heart often about life, about love. At Senhor Vinho or Clube de Fado, Lisbon’s most popular and famous Fado venues you have dinner while some of the top singers perform. The traditional Portuguese dishes were good enough and it was a fun experience. Would I do it again? Probably not, instead I would seek out a smaller, more authentic bar to hear this traditional folk music. But as first time visitor’s we felt it was a good introduction to the tradition and sounds of Fado. And a fun night out! Impressions: Well you know the song—Red, Red Wine, here in Lisbon it goes like this—Red, Red Roofs. Seriously, what struck me most was that Lisbon was a city of color—the blue of the Tagus, the colorful ceramics, the black and white mosaic floors in the city center and the colorful houses in Alfama. And yes the red of the roofs. ST. BARTHS: C'EST TOUT BON!